This kit is a complete exploration into the properties of color and light. This lab activity includes three investigations that enlighten students as they explore the many unique properties of light. Using the physical science framework concepts of Motion and Stability: Forces and Interactions (PS2) and Energy (PS3), students explore the properties of white light, build and investigate primary color wheels, and research the straight line motion of light. This kit aligns with all published National Standards. Pre and post-laboratory assessments and vocabulary words all target specific Science and Engineering Practices and Common Core standards. The teacher guide also contains specific "Did You Know" concepts that link the real world with the scientific standards explored. 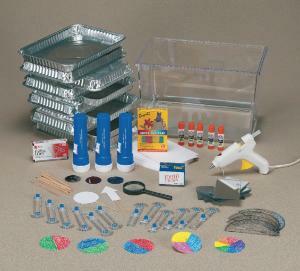 This kit includes enough materials for a class of 30 students. This activity can usually be completed in four 45-minute class periods. Investigation One and Three take 45 minutes each, and Investigation Two takes 90 minutes or two 45-minute class periods. Each of the option challenge activities takes an additional 20-30 minutes. Ordering information: This kit contains 1 package of safety pins, 1 low-temperature glue gun, 6 glue sticks for a glue gun, 5 glue sticks for cut & paste, 100 index cards, 10 protractors, 12 compasses, 4 flashlights, 1 sheet each of blue, red & green acetate, 100 wood splints, 1 magnifying lens, 1 plastic aquarium, 1 lb. package of 4 modeling clay sticks, 10 mirrors, 1 piece of white cardboard, a teacher's guide, and a student guide. Water, D-size batteries, scissors, an overhead projector, crayons, colored pencils, colored markers, and colored construction paper aren't included.